Use this guide for advice on how to search for Foreign Office correspondence dating from 1906 to 1919 and now held at The National Archives. In most cases you can search for references to the records online but you will need to visit us to view the correspondence itself. For advice on other types of Foreign Office records see our broader overview guide. Foreign Office correspondence is a rich source of information on the history of British relations with foreign states and can also provide insights into past domestic issues in countries around the world. Correspondence received by the Foreign Office was numbered and categorised. The numbers and categories were recorded on small cards and these cards served as the index to the correspondence. 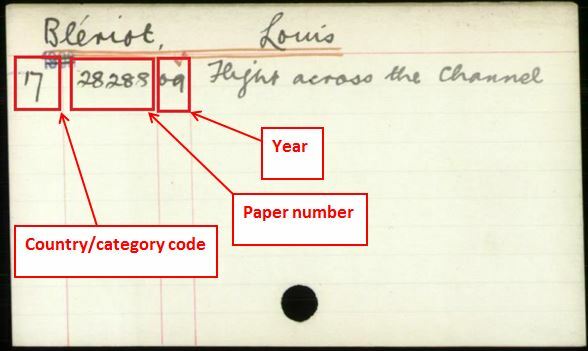 This Foreign Office card index is still used today, at The National Archives, to identify correspondence relevant to a particular country, person or subject area. Nowadays, however, the index is accessed online, in the downloadable record series FO 1111. Each category also has a corresponding National Archives’ record series (see the table in Section 3.2). 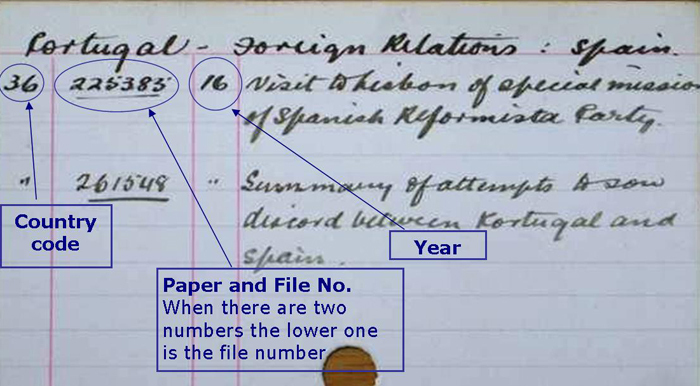 In 1910 the Foreign Office changed its registry system, making the search method for 1906-1909 slightly different to the method for 1911-1919. For 1910 itself you may need to try both methods. Not all the correspondence to which the index refers was sent for preservation to The National Archives so today some index entries refer to documents which no longer exist. For 1906-1909 (and part of 1910) you will first need to use the card index and then the general registers of correspondence before you can identify an individual piece of correspondence. Unlike the index, the registers have not been digitised and therefore you cannot view them online. To view them you will need to visit The National Archives. Use the FO 1111 series search in our catalogue to search by year only. Sort your results by reference – this will put them into alphabetical (as well as reference) order. Look for the letter (or alphabetical range) that covers your subject, name or place of interest. You may have to do some lateral thinking to find your way around the terms used for subjects in the index – you will often have to guess at how the Foreign Office would have originally categorised a subject. You may, therefore, need to download multiple sections of the index. Download your selected section of the index. Scroll through the downloaded cards until you find an entry of interest. In the example above the country code is 17, meaning it refers to political/diplomatic correspondence about France which, as the table in section 5.2 indicates, is in FO 371. The paper number is 28288. The general registers of correspondence are held in FO 566. Use the FO 566 series search to search for registers by country and year. From your search results, identify the category (diplomatic, consular, commercial, treaty, or Africa) that matches the country/category code on the index card. In this example, it is diplomatic and therefore FO 566/745. 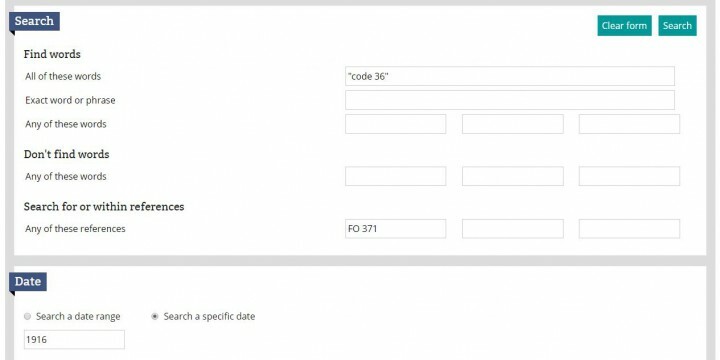 Within the relevant FO 566 register find the appropriate date. Then, on the left hand page in the second column, find the paper number. Note the number in the ‘Kept with’ column – this gives you the file where the paper is now kept. In this example the numbers are the same therefore 28288 is the file number you need. Search our catalogue for the country, and year within the relevant series reference listed in the table in section 5.2 (FO 371, FO 367, FO 368, FO 369 or FO 372). Sort your search results by reference and look for the range of file numbers which covers the file number you identified in Step 4. For file number 28288, in the example above, the relevant document is FO 371/668 as it covers files 17645-29484. Searching for correspondence from these years is a little easier as the file number is provided on the index cards (removing the need for a register). Use the FO 1111 series search to search by year only. Look for the letter (or alphabetical range) that covers your subject, name or place of interest. You may have to do some lateral thinking to find your way around the terms used for subjects in the index – you will often have to guess at how the Foreign Office would have originally categorised a subject (the card below, for example, could be categorised under Portugal, Spain or Reformista Party; or under all three). You may, therefore, need to download multiple records. Download the record and identify a card of interest within the record. Using the tables in section 5 you can see that country code 36 is for political correspondence about Portugal and is held in series FO 371. Sometimes, as in the example above, there is just one number for both the paper and file. If there are two numbers, the file number is usually the lower of the two and appears below the paper number. Use the advanced search to search by the country code within the relevant series in the relevant year. When you have ordered your document, you will see each volume is arranged in file order number, and each file is then arranged by paper number. Find your file number and within that file find your paper number. Each entry in the card index has a country/category code and a paper number. The card index from 1910-1919 also contains a file number. The codes have to be converted into National Archives document references. Extra numbers or letters were added to indicate which category the papers were placed in. The category corresponds to a particular National Archives record series (see table below). If no extra number is added then the correspondence was categorised as ‘Political’ (Diplomatic) – the most commonly used category. Once you have found a relevant entry in the FO 566 registers you can sometimes find related correspondence by identifying cross-references. Left hand pages of registers refer to incoming correspondence and right hand pages to outgoing correspondence. Entries in black in the ‘forward reference’ column (highlighted in the image at Step 5 in section 3) refer to incoming correspondence numerically arranged on the left page. Entries in red usually refer to outgoing correspondence arranged numerically on the right page. The file number can then be traced to a document reference as in step 2 above. Search for correspondence to and from the Foreign Office Library and Research department in FO 370. The Foreign Office Chief Clerk’s department focused mainly on expenditure issues and therefore covers many topics. 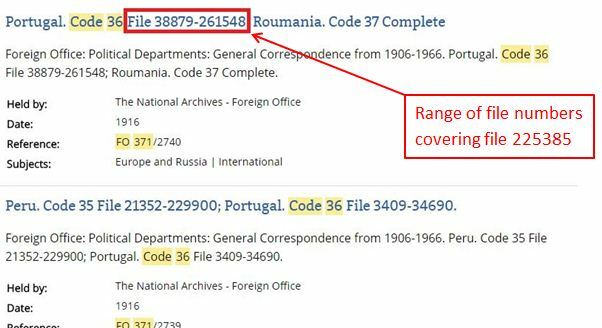 Search for correspondence and other records in FO 366.